Izzy Wheels collaborate with artists and fashion designers around the world to create stylish wheel covers for wheelchairs. Their tagline is ‘If you can’t stand up, stand out’. The concept began as a final year college project for Ailbhe in 2016 when she noticed her sister Izzy’s wheelchair didn’t reflect her bright and bubbly personality. 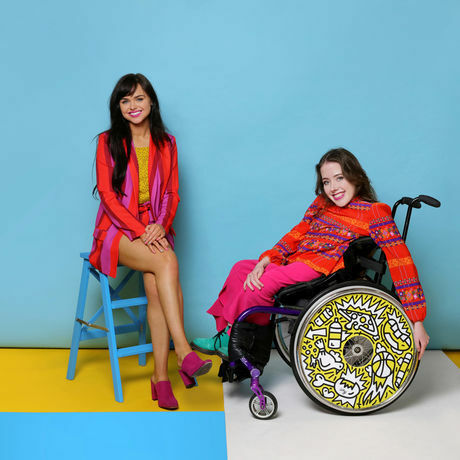 Together they created a range of colourful wheel covers that transform a medical device into a piece of fashion and self-expression. They have since been the top story in some of the worlds biggest publications including Vogue, Teen Vogue, Elle, TechCrunch, Business Insider, Vice, Oprah Magazine, Good Morning America, The Late Late Show and BBC Amazing Humans. Following viral online success online and 12 national awards Izzy Wheels are now selling in 35 countries. Both sisters were both named on the prestigious Forbes 30 Under 30 in 2018.